I am a PINTERST addict! There, I said it. I have no interest in any recovery efforts to wean myself from this addiction. I love the ideas, the art, the ability to so easily experience so many new and different art forms. My PINTEREST boards are way too full which means I surely must resort and relabel….but, the endless supply of ideas is wonderful! Recently I started pinning small stained glass for ideas for quilts. Several pins were of some wonky birds made as ornaments or sun catchers. 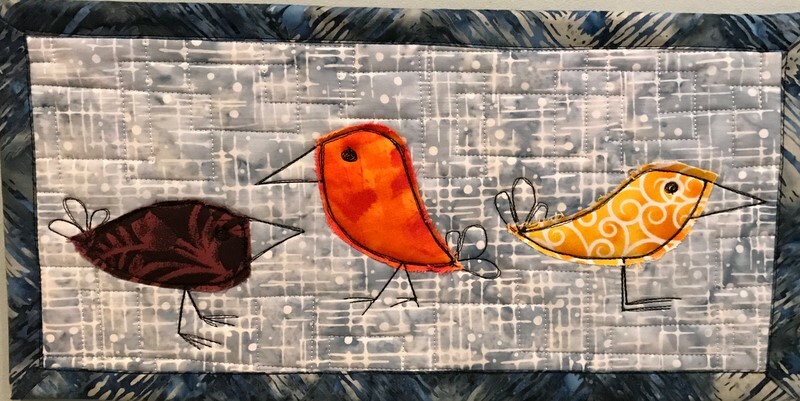 A week ago I decided NOT to work on creating art quilts for my ETSY shop and instead just messed around with these wonky birds and some creative free motion quilting. I had a blast!! 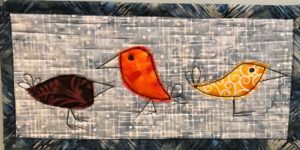 I made a small quilt of three goofy birds using rough edge applique and black thread stitching. I need some work on my technique and stitching so this first effort is not for sale but it makes me smile every time I see it hanging in our upstairs bathroom. There are still 10 days left before Xmas….who knows, maybe I can make a handful of these small wonky birds for small wall hanging gifts?! What is the holiday season, afterall, without the last minute making of gifts! After today’s post I’m taking a short break until early January. Happy Holidays and welcome to winter. We had our first snow fall last night here in central Pennsylvania, just in time for the start of a very important outdoor festival in our town of Mifflinburg, PA…the Christkindl outdoor German market. Nothing like a few inches of snow to make it really feel like Christmas.